It appears rather like a maritime version of the biblical tale of Jesus’ feeding in the desert: you take some pieces of old, mouldy wood, and from that, you create a seagoing vessel for almost 100 warriors. In year 2000 the task was placed in the hands of master shipbuilder Søren Nielsen, and now the mission is completed. The Sea Stallion from Glendalough is nearly finished and will later set sail for Dublin, Ireland, where the original Viking ship was built 958 years ago. 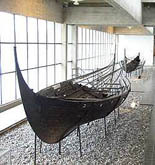 The remains of the original ship lies in the Viking Ship Museum a few hundred meters from the shipyard in Roskilde. Many tourists have been disappointed when they saw how little was actually left of the largest warship in the collection - the Skuldelev 2. A few unimpressive bits of wood lie at the bottom of a large metal frame, to illustrate the impressive size of the real warship. But to the leader of the Viking Ship Museum’s shipyard, it is exactly the right bits that have survived. Exactly the ones that are required to make a reconstruction possible. - We have almost the entire keel, and we know the distance between the ribs. We also have most of the stern, so we can practically figure out what the ship looked like, says Søren Nielsen. 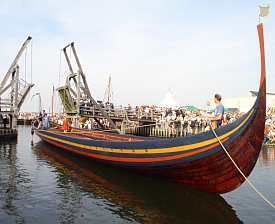 - But we do not claim to have made a 100% exact replica of the original Skuldelev 2 Viking ship . The ship is our bid, based on available data. Søren Nielsen is justifyably proud of launching the world’s largest reconstructed Viking ship, but the launching also contains a drop of melancholy - it marks the end of his and his team’s task. For four years, they have attempted to copy the way in which the Vikings made ships. - Our task wasn’t to build a Viking ship as fast as possible. First and foremost, we have gathered experience on the methods used. Quite consciously, we have prolonged the process for four years, because we wanted to experiment and record everything we did. Even minor details in the very technique employed have been pondered upon and tried out. Thus, at one point it was necessary to send four shipbuilders to Norway for two weeks to learn the correct way to use the axe for a particular cut. 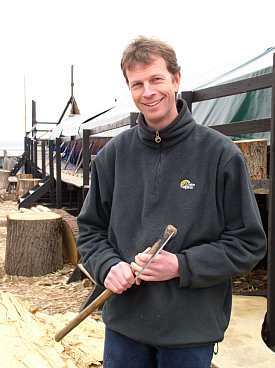 Noone in Denmark had the necessary experience in this very special axe-technique (see the article Artful Axework ed.). With a rope tied around his waist, Søren Nielsen also climbed to the top of an oak tree to chop off the curved branches with an axe, as the branches would often split if the tree was felled with the crown still in place. The curved branches are required for certain parts of the ship, as they are much stronger than they would be if they were made from a straight piece of wood. The treatment of the wood is one of the main reasons for the Viking ships being at the same time strong and flexible. The Vikings clove wood along the grain, instead of sawing it, as has been done since the Middle Ages. Afterwards, they constructed the ship by placing the planks slightly overlapping in the so-called clinker-technique. Clinkerbuilding, combined with avoiding cutting the grain of the wood by sawing, is the secret behind the lightness and strength of the Viking ship, as compared to the ships of later ages. However, it takes time to cleave planks instead of just sending it to the sawmill and having it cut, and working the wood by axe requires massive amounts of time. The number of craftsmen working on the Sea Stallion has varied somewhat. Towards the end, apart from Søren Nielsen himself, there have been eight shipbuilders and an apprentice, and the ship is estimated to have cost between 23.000 and 24.000 working hours when completed. Not all the time was spent on the old metods, though. Where it was of no importance to the learning process, electric drills and chainsaws have been employed in order to save time for more rewarding tasks later in the process. In the Viking Age, more people were probably engaged in the work. Søren Nielsen believes that there must have been about ten shipbuilders, and five "untrained hands" for a project like this. Furthermore, some twenty men would have been employed in the woods, cutting and cleaving the tree-trunks. Building the ship requires 14 large oak trees, each one meter thick. The Vikings would use an estimated 28.000 hours on building af ship like the Sea Stallion from Glendalough. 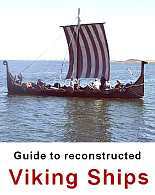 On the other hand, they would probably complete the ship in 6 months, as the Vikings most likely did not spend much time trying to figure out the right way of doing it, or documenting their progress on the computer. They knew how. If the Vikings were to see the Roskilde-project today, they would probably not be impressed by the modern attitude to work. - We know from various written sources that they were far more specialized than we can be. They had people in the woods, working on felling and cleaving, and they had specialists for many sub-processes in the building. They were even paid very differing wages, according to the status of the craft in question, says Søren Nielsen.